In worship at our church on Sunday, we focused on Jesus’ call to the first disciples: Simon Peter, Andrew, James, and John. In Matthew, chapter 4, Jesus called fishers who were hard at work along the shores of the Sea of Galilee. I imagine their hands were calloused from hard work and their skin toughened by years in the sun and wind. Isn’t it ironic that we would consider this same call of Jesus – to us in addition to the first disciples – while sitting in climate-controlled comfort on cushioned pews in front of beautiful windows? Please don’t get me wrong, I deeply appreciate our worship space, and I am deeply grateful for the gifts of many people that have made it possible. 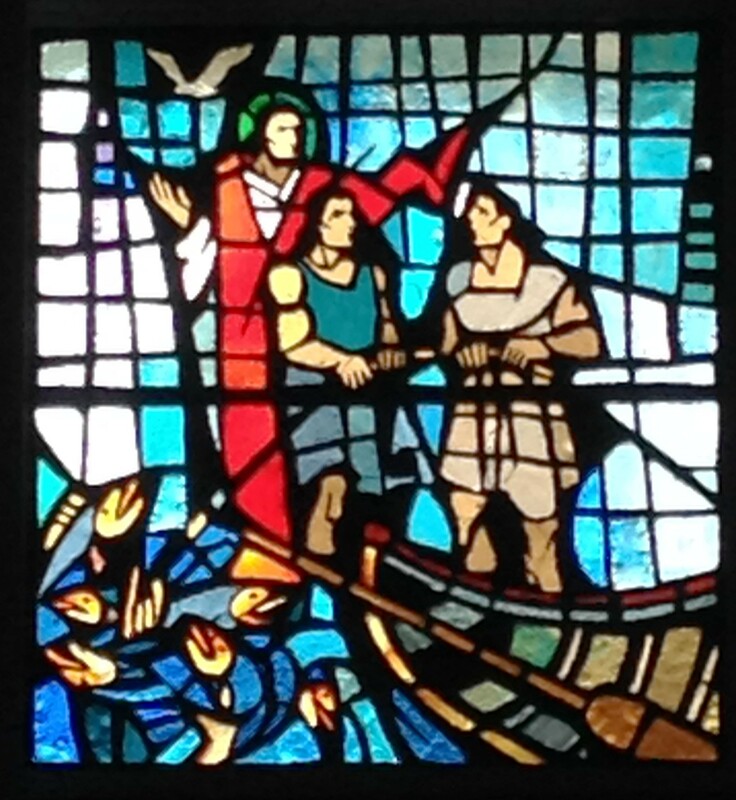 Often during worship, I gaze at the windows, see new images in them, and learn new lessons from them. Yet, in such a setting, it is easy to imagine Jesus’ call as far removed from the realities of life and having little to do with the struggles people face outside the walls of the church building. Yet, if we continue with the details offered in Matthew chapter 4, we see that Jesus and the first disciples went precisely into the midst of life’s realities and struggles. Matthew says that Jesus went throughout communities offering healing and curing diseases. When Jesus called the first disciples, he did not take them to a resort and a life of luxury. Instead, Jesus took them deeper into life’s challenges, and when they went there – together with Jesus and one another – they found true purpose, deep meaning, and the abiding presence of God’s Spirit. And, so it is with us. When we respond to Jesus’ call, we may lose our lives and their security, their safety, and their outward appeal to many people. But, it is in losing such things that we find our deepest, truest, and longest lasting peace and meaning. It was true for the first disciples, it was true for our forebears in the faith through the centuries, and it is true for us! This entry was posted in Uncategorized on January 28, 2014 by Dean Allen.